It’s been two years since the release of GTA V and the gamers cannot wait more for the launch of GTA 6. 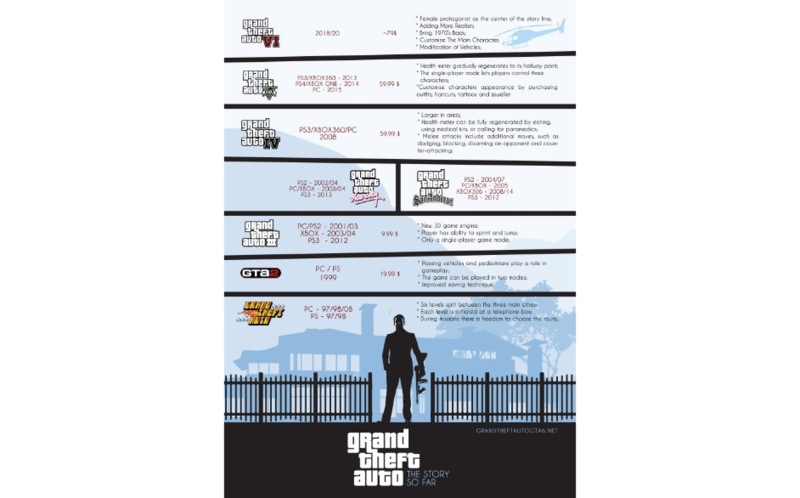 The 6th edition of Grand Theft Auto will be a lot more than a repackaging of the old features. So we have compiled quite a few things for you which we expect to see in GTA 6. But first, let us talk about the probable release date of the same. If their previous pattern persisted it would have been right to expect its release by 2016. However with the resignation of Leslie Benzies the release dates have been pushed back unprecedentedly. Much of the development is still under process and it may be 2020 before us gamers get a real taste of the 6th edition of awesome. Earlier it was proposed that GTA 6 will be based in an out of the country location which may include Tokyo or London. Tokyo was ideal for the game, but due to developmental restrictions London became the second choice. But the streets of London and the construction is not ideal for a GTA game, as per the game developers. So the game is staying within the bounds of the country this time. “Do not disregard London completely as a game location, since Rockstar has complete intentions of utilizing the city for some other game”, says our spokesperson from the Rockstar Studios. All of USA or just one state? Another rumor stated that an all country map was to be used for the next game. But an interactive map of entire USA may be a little impractical considering the time limitations and the technological limitations the developers have at the moment. Hence that is out of the question as well. In the mean time, Vice City looks promising as a host city for the 6th edition of GTA games. With the 70s swag, the cool cars and the underground gambling scene in its adolescence. GTA 6 based in Las Vegas has the potential to be a phenomenon amongst all players old and new. In addition to cool locations, several modifiable features will be added to the game. This includes customized cars, new houses which a player can buy and sell, changeable clothes and lots of new characters. GTA 6 vs. SIMS 5: is it really a thing? It may seem like GTA is taking a leaf out of SIMS’s book. Just like SIMS you can utilize your closet, modify your character and interact with other gamers inside the game. This may be a conscious effort considering the fact that SIMS 5 from EA may just be released within weeks of GTA 6. Inclusion of such customizable features is a smart move by Rockstar which will widen then player base and draw more gamers who have the love for simulation games. Now just sit back, relax and get ready to play your favorite game with Virtual Reality support on all possible platforms. PS5, Xbox 2 and upgraded PCs will be able to support Grand Theft Auto 6 without any glitches at all.